Welcome on my Chart Outlook BLOG. I don’t know if you remember. One year ago, in my Chart Outlook of 14.12.2017, I did forecast that the BITCOIN would peak around 20,000. I also wrote in my Blog on 24.12.2017 on this forecast. You just need to scroll down to “older” and you will find my blog entry from a year ago. As we all know, the Bitcoin peaked in December 2018 around 20,000, just as I predicted. I was even quoted in the Onlie-BLICK (!) for this forecast. Now, one year later, I could again become very successful in forecasting the Bitcoin, this time not for the high but for the low of the entire bear market of 2018. The chart below I published in my Chart Outlook of 8.10.2018. See the chart in the section MY PREVIOUS PUBLICATIONS. I labeled the downtrend from December 2017 as an Elliott Wave FLAT correction (A-B-C). I labeled Wave C as a five-wave structure. I counted the high of Wave 4 to have peak either on 24.7.2018 8500 or, as per the alternate count, at the high in October. The Bitcoin continued to trace out Wave 4 as it moved around 6400 until 7.11.2018 when it ended Wave 4 at the high of 6544 and SOLD OFF. In my forecast for much of this year I concluded that there should be a final Wave 5 down to end Wave 5 of Wave C. I forsaw the low in Wave 5 to be registered in November around 5000. Now, see the actual chart on the next lower chart. 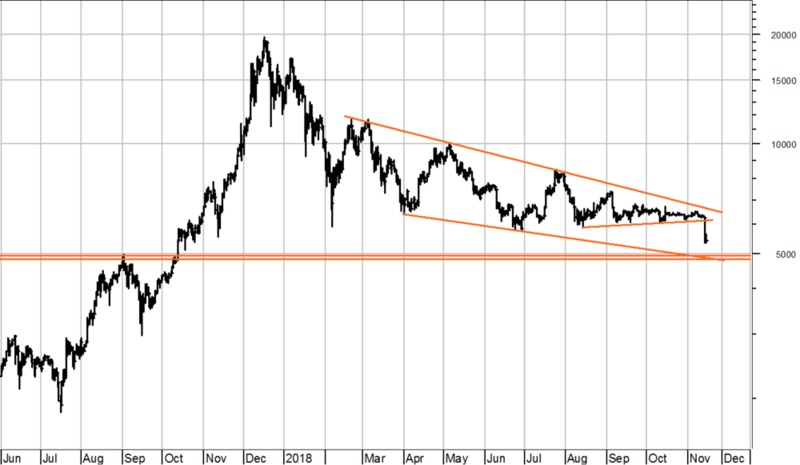 The Bitcoin broke the triangle in late June to the downside. Most likely, the Bitcoin will sell out to around 5000/4800. It could turn up there and enter a new long-term uptrend. Let’s see. The fact that the Bitcoin is tracing out the present decline towards 5000, quite exactly as I predicted, is one more proof, how critical it is to watch and track the price moves in any of the global financial market instruments. It is not so important what the fundamentals are of ther underlying. It is the fact, the all instruments are traded by thousands and millions of buyers and sellers. The interaction with the price creats a collective behaviour of all these individuals. And the collective has its own laws, regularities and cycles. It has its own speech and behaviour. If YOU would like to know how the collective drives all other financial markets YOU might want to become a regular subscriber to my Chart Outlook publications. Just use the MY CONTACT to register for your own and free TRIAL.